123connect Review 2019: Is 123connect a Good Hosting? U.K.-centric hosting provider and web development company 123connect has been in business since 1999. Its high priced plans do not offer advanced coding support, but there are some novel SEO help and customization options. Founded in 1999, 123connect is a U.K.-based (and very U.K.-centric) business offering website hosting, website design, and domain registration services. Its own “old school” website is available in English. 123connect offers a choice of Windows or Linux hosting plans, both of which use the Plesk control panel and come with the usual features you’d expect. 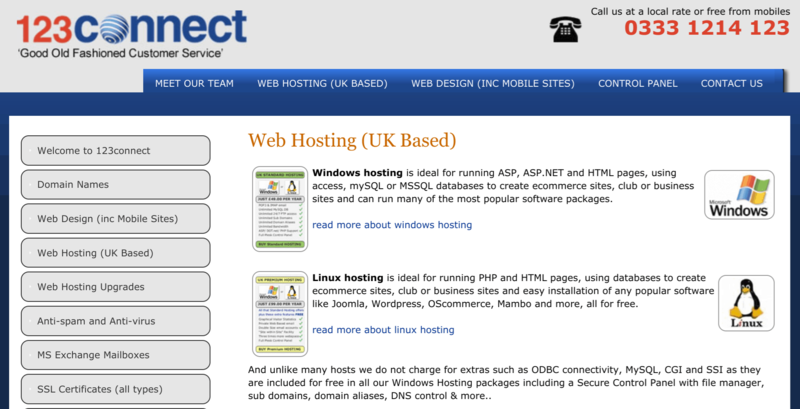 For example, the Linux hosting comes with PHP, MySQL, phpMyAdmin, Perl, CGI, and SSI; the Windows hosting supports the .NET framework, ODBC connectivity, MySQL, CGI, and SSI. Notably, there is no support for advanced coding languages, nor Cron jobs, nor SSH access. All plans come with unlimited FTP accounts, a one-click installer, and an extra-cost website building tool. Uniquely, this host offers an SEO training course that includes video tutorials to help you improve your website’s Google ranking. The hosting plans are pretty customizable with add-ons at the checkout. Additional mailbox space, server space, MSSQL databases, and extra backup space can all be added. This provider’s prices are high compared with its local and international competitors, and it’s hard to justify the prices for the features provided. But if you can get by with the cheapest (Standard) package, you will benefit still benefit from a free domain and free SSL certificate plus unlimited bandwidth, FTP accounts, and subdomains. Plans can only be bought on one-year terms, so there are no discounts for signing up for alternative stretches. You can contact this company by telephone (only local rate U.K. numbers) and email (to various departments). According to the 123connect website, you should receive a response within a few hours, but this doesn’t reflect my experience. I tried to contact the company by email to ask about any uptime expectations or guarantees, but I received no response within four business days. You might have better luck than me, but you can’t support yourself instead because there is no knowledge base. 123connect is a very U.K.-centric website hosting and web development company with an old fashioned website. Its plans are expensive and have no outstanding features, but they might suit you if you’re looking for a local U.K. hosting company with web development and SEO support. Wondering how 123connect stacks up against other Web Hosting companies? Enter any other Web Hosting company and we will give you a side-by-side comparison.